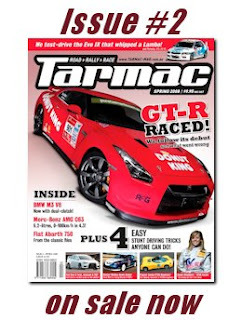 The Spring 2008 issue of Tarmac Magazine has coverage of the Donut King R35 GT-R that ran in the Targa Tasmania on April 15th , 2008. The car had minor modifications at the point it attempted to run the event. Mines ECU , Mines Titanium exhaust , Mines 400 mm brake rotors , Autech Suspension. Tsukada from ATTKD collaborated with the Donut King team on the suspension. After day one, the Donut King team was 23rd. However on Leg Two , The Sideling , going around a corner two of the tires blew. They ended up withdrawing the car as they didnt trust the tires they had. Personally I would have went down to an 19 or 18 inch tire. Especially for something like a tarmac rally. They are going over a combination of terrains and road conditions. We have already tried 18 inch wheels on the car and they fit fine. The smaller diameter wheel would have also allowed a little more sidewall. It might not have been as quick, but in order to finish first, first you must finish.